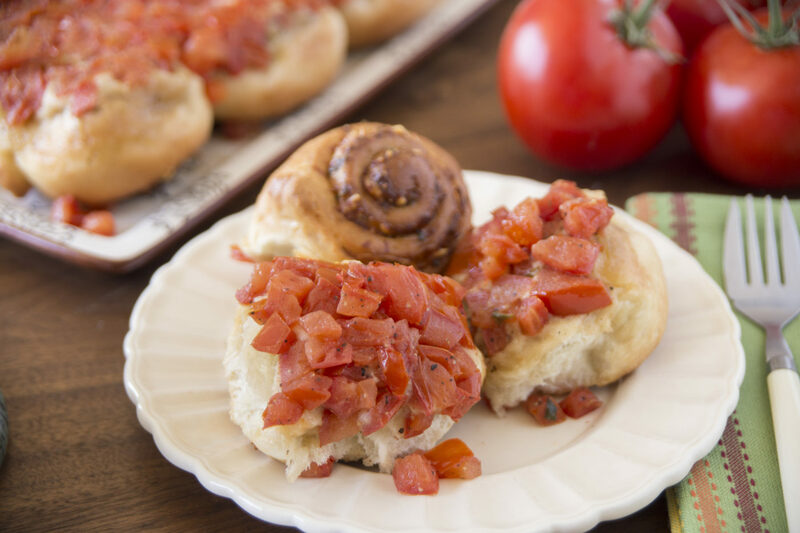 Take advantage of ripe garden tomatoes with these savory Basil and Tomato Rolls. Spray counter lightly with non-stick cooking spray. Combine rolls together and roll into a 12×18-inch rectangle. Cover with plastic wrap and let rest 10-15 minutes. Combine basil, cheese, oil, 1 teaspoon pepper and salt and set aside. Place tomatoes in a colander to drain. Remove wrap from dough and spread evenly with basil mixture. Roll up jelly roll style and cut into 12 equal pieces. Combine drained tomatoes, remaining teaspoon pepper and sugar and arrange evenly in the bottom of a sprayed 9×13-inch baking pan. Top with basil filled rolls, cut side down. Cover with sprayed plastic wrap and allow to rise for about 1 hour. Remove wrap and bake on lower shelf at 350°F 25-30 minutes. Cover with foil last 5-10 minutes of baking if necessary to prevent over browning. Cool 5 minutes and invert onto a serving platter.